The French Open, also called ‘Roland Garros’ is a grandslam tennis tournament held over two weeks between late May and early June at the Stade Roland Garros in Paris, France. Named after the French aviator Roland Garros, it is the premier clay court tennis championship event in the World. Because of the slow-playing surface and the five-set men's singles matches without a tiebreak in the final set, the event is widely considered to be the most physically demanding tennis tournament in the world. It is all set to conclude for 2016 – as the World number two Andy Murray moved through the gears in Paris after a couple of early five-set marathons, but he continued his fine form by ending Wawrinka's hopes of repeating his 2015 success in the French capital. On the other half, Novak Djokovic's hopes of landing an elusive Roland-Garros title will come down to the final for the fourth time after the top seed dismantled rising Austrian Dominic Thiem today. It marks the Serb's 27th straight Grand Slam match victory and for the second time in his career he stands just one win from becoming just the second man after Rod Laver to hold all four Grand Slam titles at once. So Andy Murray Vs Novak Djokovic in Sunday's final - a seventh Grand Slam final meeting between the pair, Djokovic winning four of the previous six. Moving away from Tennis, much of France may soon come to a halt as more workers from different industries join nationwide strikes over labor reforms, threatening to turn the Euro 2016 soccer championships into a logistical nightmare when they start next week. The French government has been scrambling to keep gas stations from running dry and cities powered after workers at oil refineries and nuclear plants walked off the job weeks ago, but its worries grew worse Wednesday as transportation workers joined the strike, hitting the country's rail and metro networks. Just a third of rail services were running Thursday, and some air traffic controllers went on strike this week, grounding at least 10,000 British airline passengers. Households and businesses throughout France have been left without power as part of a strike by union workers against the country's controversial labor reform. It comes as demonstrators hit the streets to voice their opposition to the legislation. Power cuts in Saint-Nazaire led to some 120,000 households being left without electricity just after 11am local time on Thursday. Electricity was also shut off at the town hall of Tulle, and over 1 million homes in the Paris region were switched over to a low-cost power supply, Reuters reported. It comes after members of the CGT union at 16 of France's 19 nuclear plants – which provide the majority of the country's electricity – voted for a one-day strike Wednesday. Along with addressing sector-specific demands, the strikes and power cuts are aimed at protesting a much contested labor law reform forced through by President Francois Hollande's Socialist government, which will make it easier for employers to hire and lay off workers. If you are a fan watching Roland Garros, this is another photo, you would wish to see – a masked French protester swatting away a smoke bomb using a Tennis racket at violent labour reform demonstration. MailOnline reports that tension over France's new labour laws continues to boil over across the country with protesters and riot police clashing in the western city of Nantes. 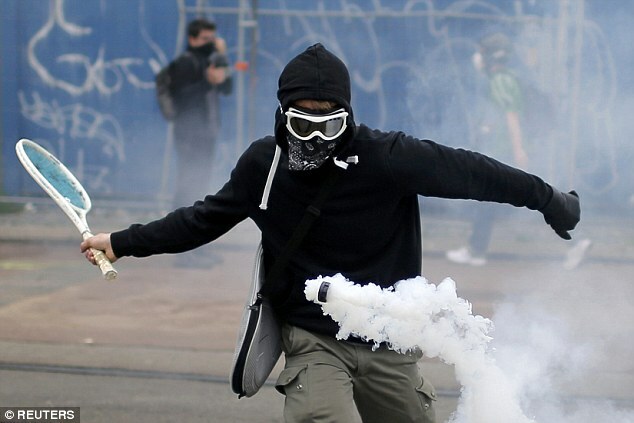 Shown on this photo is a protester looking fit to hit the French Open at Roland Garros as he used a tennis racket to return a tear gas canister during the demonstration, which also saw a number of hooded youths smash shop windows in the city. The government is scrambling to end the wave of protests that has been taking place all over France in recent months, fearing that they could disrupt the Euro 2016 football championship. The French government has pleaded with protesters to end their strikes and demonstrations, fearing the industrial action may put Euro 2016 at risk. The open-ended national stoppage on the railways has reduced train services by about half, a week before the June 10 opening of the Euro 2016 which should draw some 2.5 million fans, many from abroad. The disruption was compounded by the worst flooding in at least 30 years as the Seine river broke its banks in the centre of Paris, forcing closure of a commuter train line and a halt to barge transport on top of massive traffic jams on flooded motorways.